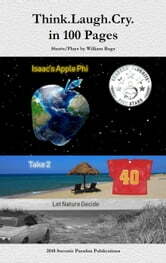 Isaac's Apple Phi - Never again will you look indifferently into the dark screen of your cell phone. Isaac’s Apple Phi begins, humbly, in a New England-esque apple orchard and ends in a frenzy with readers left pondering whether God, gods, artificial intelligence, mega-corporations, or humanity is in control. Though deeply influenced by the shorts of Sci-Fi heavy-hitters like Asimov and Orwell, Isaac’s Apple Phi is a near-term dystopian work like none other. From romance, to WWII history, to Marxist economic theory, to lively discourse between a man and his communications device, the themes can be snacked on lightly or voraciously digested. One need not be a Sci-Fi aficionado to enjoy Phi. A desire for a smart story involving a smart phone will do just fine. Take 2 - Tap your sophomoric humor funny bone with Jeff Jondawski and his wife Shelley. Jeff wishes he had some “do-overs” in his life. After dreaming with outlandish 20/20 hindsight, Jeff comes to terms with his real life, which isn’t so bad after all. Let Nature Decide - Simple scene, intense drama. In blue-collar Southpoint, loyalty is the only currency. Once inseparable friends, Danny and Tommy see their boyhood bond eroded by the tide.